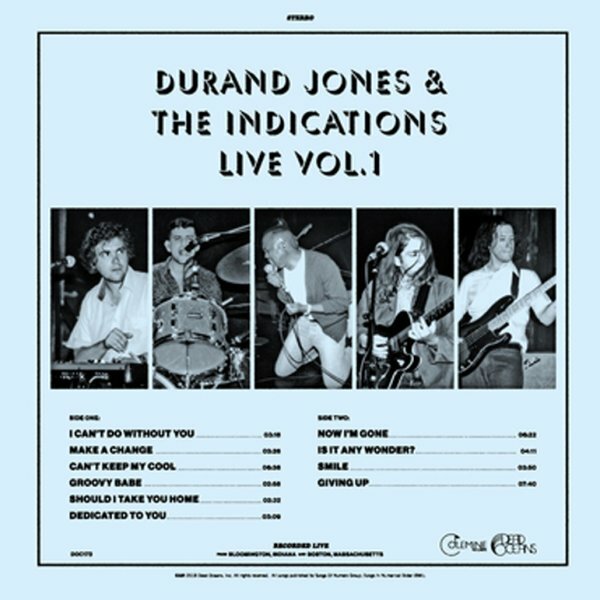 A smoking live set from this ultra-funky group – a combo who've got the mighty Durand Jones to send them over the top with his deep soul vocals! The set features live material recorded in Boston, and closer to home in Bloomington – with titles that include "Now I'm Gone", "Is It Any Wonder", "Smile", "Should I Take You Home", "Dedicated To You", "I Can't Do Without You", "Can't Keep My Cool", "Make A Change", and a seven minute workout on "Giving Up". © 1996-2019, Dusty Groove, Inc.